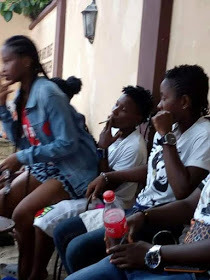 Sapele Oghenek Facebook page posted these of young girls pictured smoking weeds at Peemos Hotel yesterday. According to their report, the girls are deeply involved in lesbianism, drugs and violence. Read below. 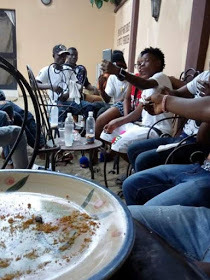 and d one with white,wey her name na Rejoice, wey carry dread talk say,she go deal with Tafia on everyday thing,why the blue one wey be Lesbian partner to the one with white,wey her name na Sarah,and wey wear blue begin talk anyhow. 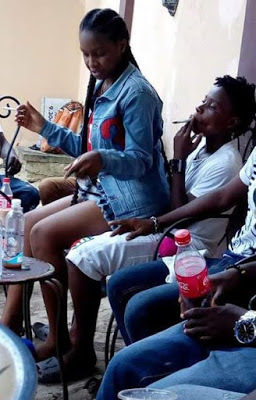 As we speak this little girls don dey practice lesbianism and dey smoke and drink hard drugs to kill deir cells. We dey call on deir family members to carry them Sidon and borrow them sense before them go begin catch enemies for deir family head. Na who like Jail,dey find Tafia for street. Life na sense. Na deir pictures wey dem use take dey smoke and seduce deir selves dey attached to this post so."